But apart from the promises of 'Jam Tomorrow', what I found most interesting is the use of the word resources. 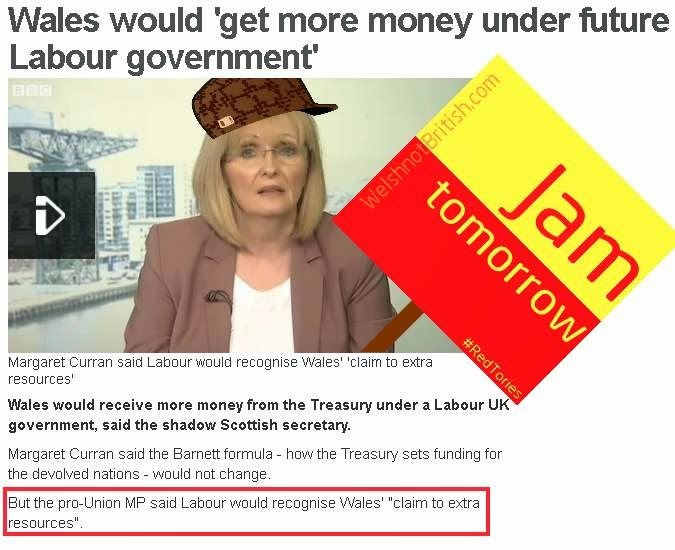 In particular Maggie stated that Labour would recognise Wales' "claim to extra resources". Now I should point out that when Maggie mentions resources she is not referring to natural resources. And the reason she is not referring to natural resources is because MPs from her own party do not even want their own people (whether they are in Scotland or Wales) to own the natural resources from their own country especially if it at the expense of England. 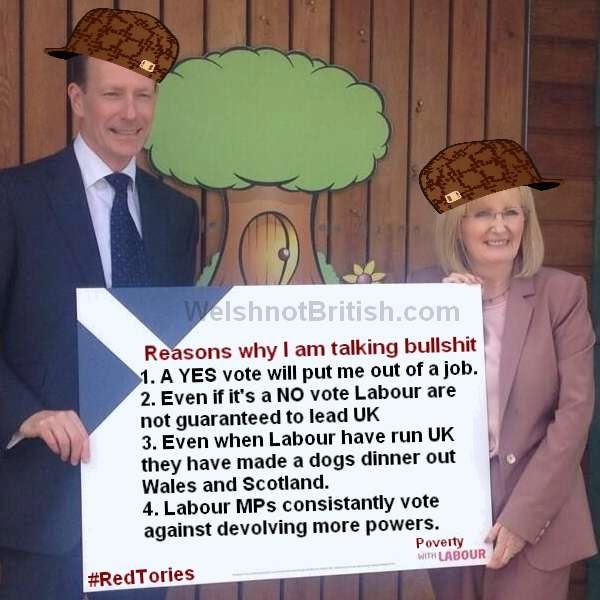 Apart from the very obvious fact that Margaret Curran may well be out of a job if Scotland votes YES which makes any promises she makes redundant as she will not be around to carry them out. Even in the event of a NO vote there is also the fact that there can be no guarantees that Labour will even form the next UK government. And even when they did have a strangle hold on both the UK government and Welsh government they still made a complete and utter mess out of it. And then finally there is also the irrefutable evidence that Labour MPs in Wales do not want to afford the Welsh Government any more powers than they already have. Let's look at the list. The Government of Wales Act 2006 gave control of all water in Wales over to England. And just in case you are wondering they haven't changed their minds because earlier in 2014 they all refused to back a motion of bringing the water in Wales under the control of the people of Wales. Labour also do not want Wales to have control over energy or The Crown Estate. Vast swathes of Welsh land, all of our sea and our mineral resources both on land and at sea are stolen from us with no benefit to Wales. Even something as simple as devolving airport passenger duty so that the airport that the Labour government in Cardiff bought on behalf of the people of Wales can encourage more passengers via cheaper flights is blocked with help from our very own Labour MPs. Why is it blocked in Wales (and Scotland) yet it is allowed to be devolved in the Six Counties? Well it's quite simple really. These scumbags want our countries to be able to compete with the countries of the world but not be able to compete with England. Lowers duty at a Welsh airport (even ones that claim to be English) would lead to Welsh airports being able to poach more customers from English airports. Poaching customers from Ireland is fine as it's not part of their 'one nation'. Now imagine if the energy, water, minerals or even our own domain name that is exported stolen from Wales to England was used in a way that could poach companies from England into Wales and you are starting to realise why the one nation British nationalists in the Labour Party do not want Wales to compete with England. The question people should really be asking Labour is why they would rather our countries are run by Tories in London than by their own party in Cardiff or Edinburgh?